Throughout most medical offices and hospitals, Point of Care mobile medical carts are the new norm for doctors and nurses. Not only do they increase efficiency in time and mobility, but they also decrease errors that routinely cost the healthcare industry billions of dollars each year. Because mobile medical carts are so easy to maneuver and transport, doctors and nurses can have access to their patients’ vital medical records right at their fingertips. They can also transport supplies and tools necessary for any procedure, allowing them to have more direct patient care and quality time with their patients. Medical errors cost the healthcare industry between $17 and $29 billion each year. The costs of these errors get passed on to other healthcare professionals and patients through insurance companies. Healthcare professionals must carry malpractice insurance for cases like these, and for some doctors, this can mean upwards of $30,000 in yearly premiums. 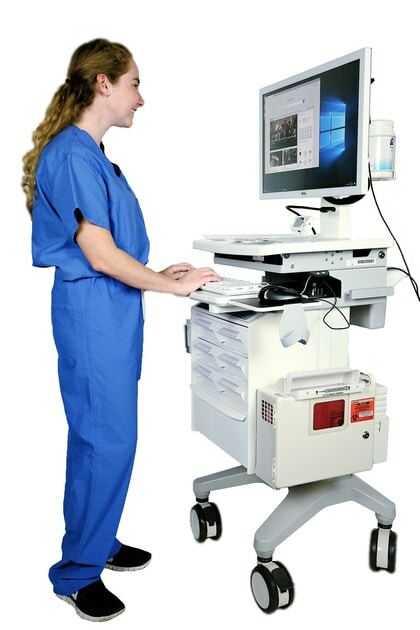 Medical workstations on wheels allow nurses and doctors to enter patient data immediately, which has been shown to decrease the frequency of errors compared to when patient data is entered at a later time. Healthcare providers can verify information with the patient directly, and doctors can interpret health information and test results in a meaningful way with the patient there to provide additional details. Because data can be entered in real-time in a patient’s room, there is less time spent by nurses and doctors entering data later on. This can mean a reduction in overtime hours by medical staff who often have to spend additional time after their shift just entering information into the electronic health records system. Doctors and nurses don’t have to leave the patient’s room as often to retrieve test results, order tests, or grab supplies. Many Point of Care mobile medical carts are equipped with storage drawers so that gloves, bandages, and other tools are conveniently on-hand for direct patient care. With the extra time spent with the patient, the patient’s overall satisfaction with their care increases. Most mobile medical carts are incredibly easy to push and maneuver. Their lightweight frame, coupled with wheels that spin in all directions for versatility, make them effortless to push through crowded hallways or small patient rooms. Nurses and doctors can now take their expertise and care directly to the patients, no matter where they may be located. In nursing homes, getting back into bed from a chair can sometimes be a challenge for the patient. Having the ability to wheel the cart and supplies directly to wherever the patient is located is an incredible mobile efficiency. With Point of Care mobile carts, most of the data entry and information is completed beside the patient. This setting allows for intimate and sensitive medical information to be kept confidential, better complying with HIPAA laws. Point of Care carts also eliminates the need for paper charts, which can contain confidential patient information and get lost easily. Once the data is entered into the system, the doctor or nurse can access it later without having to transport or locate a chart. Mobile Point of Care carts are equipped with long-lasting battery power packs. These battery packs provide between 6-10 hours of power, with some lasting longer depending on the equipment included on the cart. Many carts include hot-swap battery systems, which provide minimal disruption for the healthcare professional as they work. 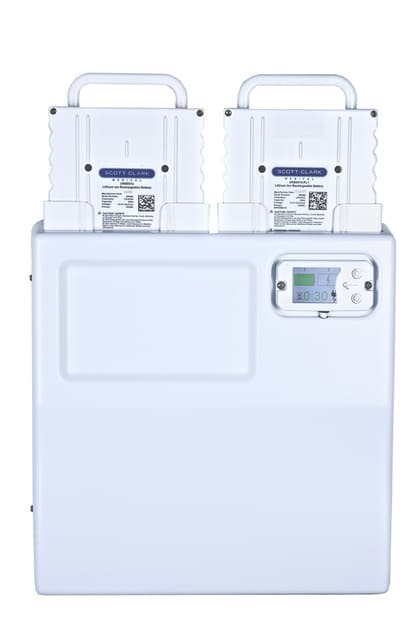 Most hot-swap batteries can be quickly switched out in 30 seconds or less, and the new battery will be ready to power your cart for the next 6-10 hours.